Every summer I find myself reading the Psalms. I use a one-year Bible reading plan found in the Our Daily Bread devotional. The July and August Old Testament readings are in the Psalms. I enjoy how these verses bring such comfort and offer so many meaningful prayers. When my husband and I were engaged to be married, a missionary gave us this advice: Read one Psalm a day to count down the days to your wedding. We followed his suggestion and it really was a blessing! Now I think how this idea could be used by others for their weddings, to await the arrival of a baby, to anticipate healing, and so on. Perhaps you’d like to try reading one Psalm a day, too, as you pray and wait upon the Lord. Or you might try a Psalm TEA CUPP with these verses from Psalms 41-50. Pray one or all these verses each day this coming week as you pour out your heart to Jesus. Today’s TEA CUPP: Dear TEA CUPP Friend, you are invited to TEA every day with the King of kings! I hope you will enjoy your time in the Psalms with Jesus. 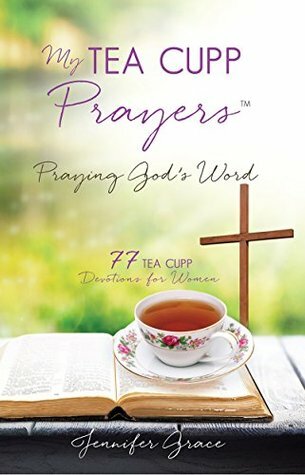 Underline your favorite verses for your own special TEA time. Soak up His Word today. Today’s TEA CUPP: 1 Peter may be a short book in the Bible, but it is sure packed full of delicious verses! Pour your favorite 1 Peter verses in your TEA CUPP today. Write them on note cards and put them in your kitchen or on your bathroom mirror. Savor all 1 Peter has for you, praying these verses back to Jesus. Today’s TEA CUPP: My Bible study leader, Terry, says we should chew on God’s Word as a cow chews her cud, over and over again. This week, chew on Philippians 4:4-7, praying in order of the verses, or in order of the TEA CUPP for variety. By the end of the week, you may have it memorized and can pray it anywhere! Be blessed in Philippians, my friend!